Taking my son’s arm I made my way up the flowered aisle. As I glided in my Badgley Mischka gown past our nearest and dearest towards my handsome groom, I tried not to spoil the picture by looking up. But it wasn’t easy, because ranged above me in tiers of theatrical balconies were a thousand strangers, waving and cheering. Most of them in shorts and flipflops. 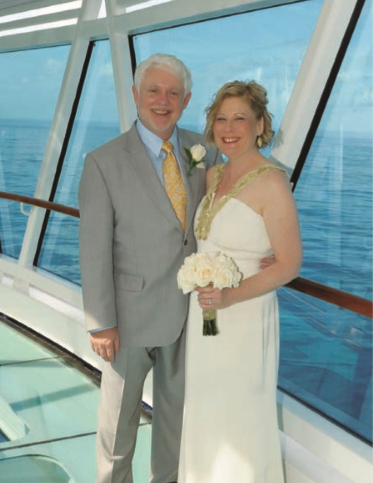 For David and me, getting married on a cruise ship had seemed the natural choice. After all, we’d met at sea – two journalists on assignment – so what could be nicer than surrounding ourselves with friends and family for a spot of warm-weather togetherness? 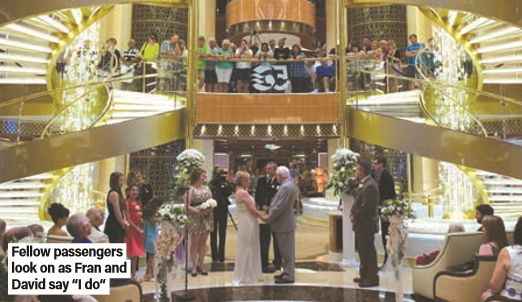 Princess is among the lines that offer at-sea weddings, and a cruise from Florida to the Bahamas on Regal Princess, their newest, 3,560-passenger ship, felt like a perfect fit. In our minds we’d pictured a modest ceremony in the ship’s chapel. But since we are both writers, the cruise line spotted a promotional opportunity and asked if we’d mind a slight change of venue – to the ship’s three-storey Piazza Atrium. 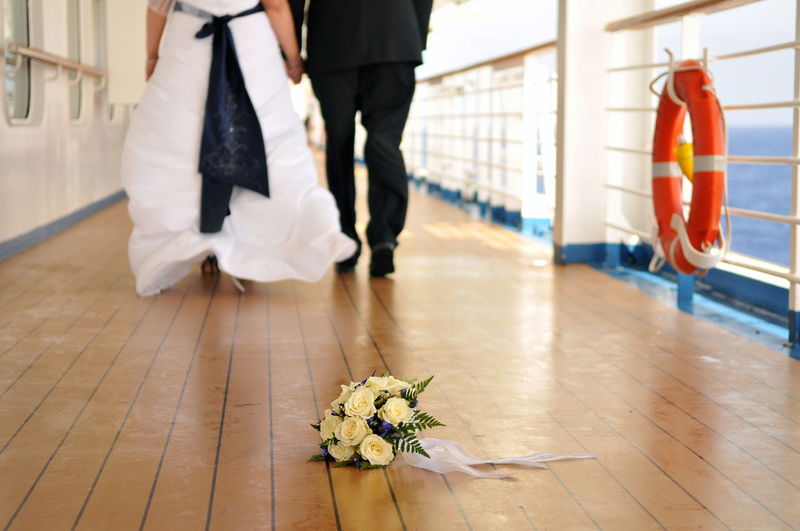 Princess Cruises makes wedding planning super-easy. Once you book – group rates are available if you reserve enough cabins – its “Tie the Knot” programme puts you in the capable hands of Royal Ocean Events, who organise some 1,000 cruise-ship weddings each year. Our coordinator/fairy godmother held my hand throughout, via email, phone and text, and the whole process was virtually stress-free. She politely made suggestions and was patient with my usual response of “Huh?” (as in, “What flavour of cake do you want?” Me: “Huh?” Or, “Have you thought about flowers for the flower girls?” Me: “Huh?”). For the record, we had one tier of carrot cake and another of red velvet covered with white frosting, and the flower girls (David’s granddaughters) carried rose-topped wands to match my hand-tied ivory rose bouquet. Our family and friends had responded surprisingly well to the idea of nautical nuptials – only my sister-in-law asked if I had lost my mind – and we had guests from as far away as London (paying for their own flights and cruise fares). published in a Bermudan newspaper. There was also a stipulation that Captain Perrin recite official Bermudan wording at our ceremony, though we added our own vows and readings (thank you, Capt Stubing). One of the best things abut a cruise-ship wedding is that all the expertise you need is likely to be on board already. With florists, caterers, bartenders, hairdressers and photographers you have a floating creative team at your service, as long as you’re willing to pay. So photography and video were arranged, hair and make-up appointments made, and we booked a five-course wedding luncheon for our party in the ship’s Italian restaurant – a steal at $25 per person – added unlimited wine (from $16 per person) and prepared to let the wedding speeches flow. By the time my son escorted me down the aisle, our dream wedding had turned into a truly glamorous affair. And when it was all over, after we had signed our names to a wedding certificate bearing the ship’s coordinates, we were able to shed our fancy clothes and relax with our loved ones for the rest of the cruise. What more could a bride ask for? Start off by checking with your friends and family. Make sure the important folks are willing to join you at sea. Save yourself a lot of hassle and get a travel agent to handle everyone’s cruise and air bookings. Listen to your wedding planner. She’s the expert, can see the big picture and will work out the details. Take your wedding dress on the plane as hand luggage. Then you know it can’t get lost. Weddings go by so fast. Take it slow and embrace all the hoop-la. Treat yourself to something different, such as a visit to the ship’s spa for a beard trim, facial or pedicure. Don’t let the ladies have all the fun. Get to know the folks on the other side of the aisle. Your best friends may be aboard, but there’s no better opportunity for schmoozing with your new family. If you have never been on a cruise before, try one now. Book a short trip so you will know what to expect during your wedding sailing.